AN OPINION poll in early January 2016 had one of the least surprising findings of any in the last few years. It said that around 87% of respondents wanted neither François Hollande nor Nicolas Sarkozy to be President of France after the elections next year. All over Europe voters despise the political class but nowhere does that feeling seem more toxic than in France. Since M Hollande presided over a fall in growth, a rise in unemployment and the continuing stagnation of his once-great country by implementing insane hard-left economic policies in the first couple of years of his quinquennat, it is hardly surprising his country longs to see the back of him. He responded calmly and nobly to the hideous events of November 13 in Paris: but even the credit he earned for that quickly wore off. Now, instead, he is viewed as just another European leader who endorsed open borders and uncontrolled immigration, and a man who as such has been one of those who brought upon France the current anger, fear and discontent it is experiencing. And, of course, he pops out for a cinq à sept in disguise on the back of a moped. 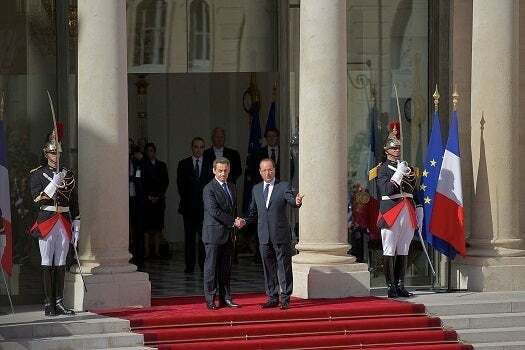 M Sarkozy seemed a different matter. Having kept out of politics for the two-and-a-half years after his defeat in 2012, he made something of a triumphant return – at least in the eyes of the militants of his party, then called the UMP, now Les Républicains. There had been an unseemly civil war in the party between Jean-François Copé and François Fillon, the former having beaten the latter by a whisker in a ballot for the party presidency after M Sarkozy’s defeat. M Copé was accused of ballot-rigging and other improprieties, but nothing was ever proved on that front. He was, however, forced to resign in 2014 over a financial mismanagement scandal, although his head has recently been raised once more above the parapet. M Fillon survived five years as M Sarkozy’s prime minister, though the loathing between them was concealed until after the defeat. Almost uniquely on the French right, M Fillon has no criminal record and nor does he face the prospect of being sucked into a scandal. Perhaps as a result he is simply too boring for the French public, who seem to like being ruled by rogues. He did not challenge the increasingly sulphurous-smelling M Sarkozy for the party presidency in 2014, when the former head of state took 65 per cent of the vote. Nor did Alain Juppé, the former prime minister and present mayor of Bordeaux, who did have a criminal record. However, M Juppé is widely seen to have taken the blame for misbehaviour by Jacques Chirac, his boss, and therefore the ban imposed on him from serving in a public position (and which has now expired) has come to be seen as a badge of honour. M Fillon, who has said he will leave politics if he does not win the Républicains primary this autumn, should perhaps begin to plan his alternative career. Though decent, he is uninspiring – and perhaps too tarred with M Sarkozy’s brush. M Juppé, however, seems to be heading for victory in the primary, though no one should underestimate the ruthlessness and determination of M Sarkozy in getting himself back into the Elysée Palace, or that of his adherents. It is easy to understand why M Hollande is doing so badly in the polls. But why is his predecessor? After all, he won his party’s presidency easily. He remains tainted by half a dozen separate scandals, but – as has been demonstrated – France worries about such things far less than the AngloSaxons do. It is hard to imagine a politician with as many rumours surrounding him as M. Sarkozy has being a viable candidate for the highest political office in either Britain or the US; or one who has been temporarily banned from public life, as M. Juppé was, making a comeback in those countries. No – the sudden decline in the Sarkozy fortunes is for other reasons. Candidate Sarkozy has remarkably little to say about how he would transform France. There is a sense of entitlement to regain office on his part that comes over as arrogant and not entirely pleasant. He has tried to tone down the bling, and keep his supermodel chanteuse wife at arm’s length in public, but there is still a grandeur about him and his approach to politics that has nothing to do with morality or statesmanship. He relies on an image and a presence to convey the arguments about why he deserves to be put back in power: France, and indeed the wider world, waits expectantly to hear what policies the candidate has that will make France great again. Even then, however, his word may not be trusted: his plans for his last term in office were one of the country’s biggest disappointments since the Franco-Prussian war. By expressing its interest in M Juppé, France is not showing its tolerance of scandal-hit politicians (although it has to tolerate them, because there are hardly any who are not). It is looking for a president not already tainted by failure in that office. Bordeaux, thanks not least to initiatives taken there by M Juppé, is one of the most impressive and enjoyable cities in Europe: if all France could be ruled with the same intelligence and thoughtfulness, would that not be grand? And he has two other advantages: the difficulties of his premiership are 20 years ago and widely forgotten, and since he will be 77 by the time of the 2022 election, his electors will have to tolerate him for only one term. The race will, I am sure, turn dirty – M Sarkozy knows no other way – but I would back the mayor of Bordeaux to win.